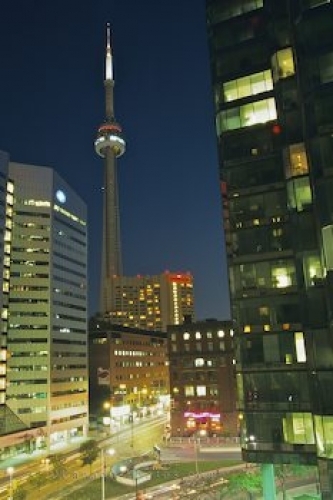 In the daylight hours in the downtown core of Toronto, Ontario, the CN Tower can be seen for miles but at night the lights from the tower highlight the skyline. The CN Tower is the world's largest tallest building complex that reaches heights of 1,815 feet. CN Tower in Toronto, Ontario, Canada, North America at night. Picture of the night lights of the CN Tower and surrounding buildings in Toronto, Ontario.